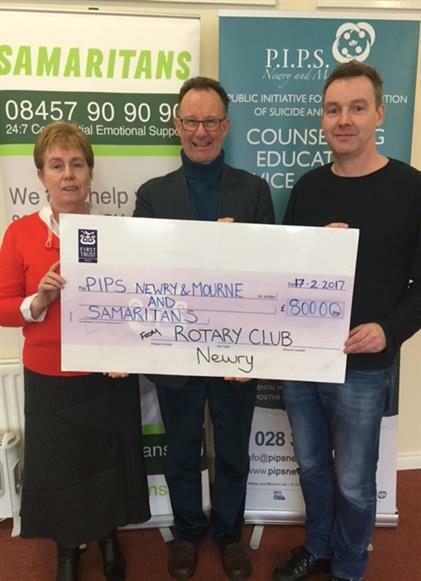 President of the Rotary Club of Newry Patrick Loughran recently presented cheques of £400.00 to both PIPS Newry and Mourne and the Samaritans. The funds were raised through the 2nd Annual Tree of Remembrance hosted by Newry Rotary. Pictured receiving donations are Mary Burns of Samaritans Newry and Eamon Murphy of PIPS Newry and Mourne.. The Rotary, Samaritans and PIPS Newry and Mourne were delighted to collaborate on this great project, and sincerely thank The Quays management and the public for their support.